Pulling Out Hair Over Student Loan Questions? "Give Me Just 60 Seconds And Let Me Explain How I Am Going To Blow Your Mind And Fill You In On All The Little Known Facts Pertaining To Student Loans And What You Need To Know About Them!" Time Is Running Out For You To Get Your Hands On This Vital Information On Student Loans... Only 150 Copies Are Available! Are you struggling to find the means to pay for your college education? Maybe you feel like a chicken running around with it's head cut off trying to find the appropriate answers to your questions regarding student loans. Or maybe you feel like your dreams of acquiring a college education are thrown out the window and kicked to the curb due to the inability of paying for those high college tuitions all at once. With today's costs of living rising from day to day, students find it hard to come by the money to further their education and obtain the degree that they have always dreamed about. So does this mean that your hopes and dreams of a college education have come to a halt? Of course not! There are many ways for students to pay for a college education even if they don't have the financial means to pay for their college expenses all up front and still have money left over to pay their day to day expenses. "Imagine Having All The Information You Need To Know About Student Loans And Grants Right At Your Fingertips!" Imagine being able to pay for all of your college tuition, books, and other school supplies, along with having extra money to cover all of your everyday college expenses. Think for a moment about the luxury of not having to work a full time shift job while attending school just to try to make ends meet each month, giving you more time to focus on the important things, like your college education. Allow yourself to imagine obtaining the degree you have always wanted and pursue the career you have always dreamed of, without the financial hardship involved in the high costs of a college education. Picture yourself hassled no longer with the stress and worries of finding the financial means to attend college. No more fishing for answers on specific student loans and grants that are available. 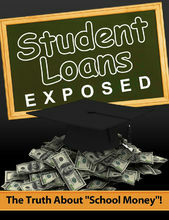 Never again deal with the confusion of the different student loans that are out there today. "I Have Done Mega Tons Of Research Solely Surrounding The In's And Out's Of Student Loans And Grants To Help Potential College Students Find The Perfect Loan Solution For Them." Whether you are seeking information on the stafford loan, private student loans, personal student loans, or government funded grants, I have acquired all the necessary answers for your top frequently asked questions. I have also included the specific specifications and requirements for each type of loan and grant. I have found that many people struggle to find the answers to the "need to know" questions, many times searching for the answers in tons of places and still coming up short of the proper answers that they are looking for. "Get All The Answers And Straight Facts On Any Student Loan Imaginable... With No B.S. Added!" 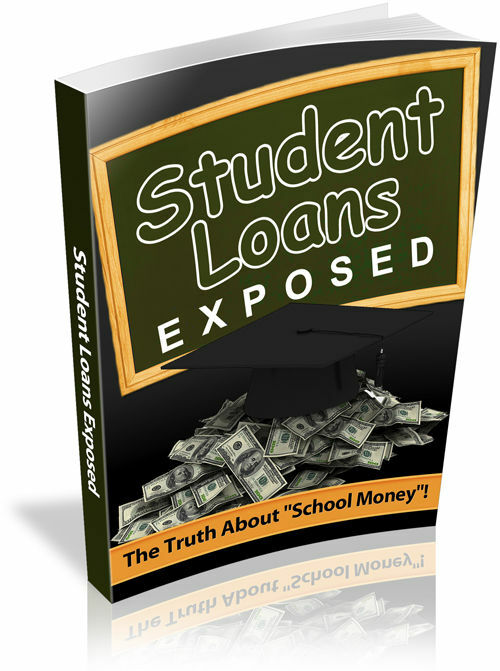 Introducing...Student Loans Exposed Just Check Out What's In This Baby...Student Loans Exposed Get all the exclusive information that's jam-packed into this informative and detailed report on any type of student loan that you can possibly imagine! You will get all the "need-to-know" information you have been digging for without spending a gazillion hours searching for it! Learn about the advantages of each loan, as well as the disadvantages when it comes to choosing the right one for you! Don't go around wondering if you have made the right decision on your student loan, be confident with your choices you will make after getting your hands on this vital student loans report! Here's just a few things this priceless report holds... Get the 4-1-1 on the differences between choosing a private student loan and a personal student loan, as well as the qualifications for each! Learn about how even if you have bad credit you can still obtain a student loan that fits the students financial needs! Discover how consolidating your student loans can make it even easier for students that are having to have more than one loan to pay for their college expenses! Get step-by-step information on the process of getting your student loan and what loan offices specifically look at when determining if a student is eligible for certain loans! Looking for answers on questions about repaying back your student loans? Look no further! This report will teach you how to protect you and your credit when dealing with repayment options concerning student loans! "Give Me Just 60 Seconds And Let Me Explain How I Am Going To Blow Your Mind And Fill You In On All The Little Known Facts Pertaining To Student Loans And What You Need To Know About Them!" Time Is Running Out For You To Get Your Hands On This Vital Information On Student Loans... Only 150 Copies Are Available! Are you struggling to find the means to pay for your college education? Maybe you feel like a chicken running around with it's head cut off trying to find the appropriate answers to your questions regarding student loans. With today's costs of living rising from day to day, students find it hard to come by the money to further their education and obtain the degree that they have always dreamed about. So does this mean that your hopes and dreams of a college education have come to a halt? Of course not! There are many ways for students to pay for a college education even if they don't have the financial means to pay for their college expenses all up front and still have money left over to pay their day to day expenses. "Imagine Having All The Information You Need To Know About Student Loans And Grants Right At Your Fingertips!" "I Have Done Mega Tons Of Research Solely Surrounding The In's And Out's Of Student Loans And Grants To Help Potential College Students Find The Perfect Loan Solution For Them." I have also included the specific specifications and requirements for each type of loan and grant. I have found that many people struggle to find the answers to the "need to know" questions, many times searching for the answers in tons of places and still coming up short of the proper answers that they are looking for. "Get All The Answers And Straight Facts On Any Student Loan Imaginable... With No B.S. Added!" 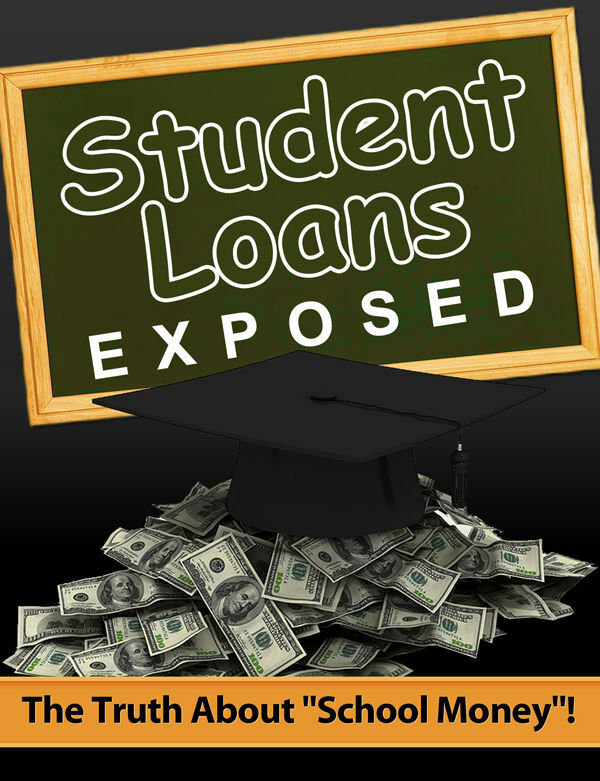 Get all the exclusive information that's jam-packed into this informative and detailed report on any type of student loan that you can possibly imagine! You will get all the "need-to-know" information you have been digging for without spending a gazillion hours searching for it! Don't go around wondering if you have made the right decision on your student loan, be confident with your choices you will make after getting your hands on this vital student loans report!